For adding a down-home, simple feel to any dining area, the Tuscany flatware series is optimal for anyone looking to create an informal, yet engaging setting. This cocktail/oyster fork is measured at 5 1/2'' long and boasts 18/0 chrome-plated stainless steel with a satin finish. A three tine design allows for picking up nearly any type of food. Typically reserved for appetizers prior to the main course, this type of utensil is as versatile as it is stylish. Classic flatware is an essential part of any kitchen, whether in a restaurant or at home. Delight in one of our simple, yet elegant stainless steel flatware sets today. We worked hard to design a flatware set that gives you all the features you want at an affordable price, including High-quality elegant design stainless steel spoons Durable strong construction that will last for years to come Well-balanced to fit securely in your hand Heat-resistant, won't bend and dishwasher safe With proper care and a little bit of love, our mirror polished, stainless steel flatware will feed your family for years to come.Our Customer Satisfaction Money-Back Guarantee. If for any reason you are not satisfied with our products just return it within 14 days for a full refund. No questions asked, no hassle.To set your table in style scroll up and click the Add to Cart Button to get your Flatware Set shipped today. 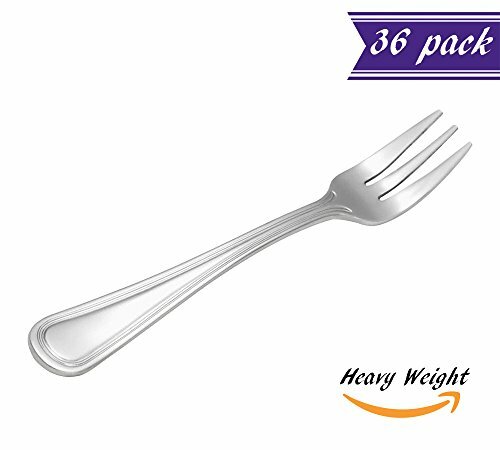 Durable High Grade 18/0 Stainless Steel Oyster / Cocktail Fork with Extra Thick Ergonomic Handle. Working ends are modern, functional and comfortable. Ideal choice for Casual Dinner Service, Catering Services, Restaurants, Bars, Hotels, and more! 5 1/2-inch Long Heavy Weight Oyster / Cocktail Fork. With proper care can Last for Lifetime. Easy to Clean. Dishwasher safe. This Oyster / Cocktail Fork is a part of our Tuscany Flatware Collection which represents a simple construction of the handles that features an stylish design that is ideal for formal place settings. Thanks to the sophisticated shape and the shiny luster of this flatware, it will blend in at Banquets, Country Clubs, and other Upscale Dining Locations. View More In Specialty Forks. If you have any questions about this product by Tezzorio Tuscany Flatware Collection, contact us by completing and submitting the form below. If you are looking for a specif part number, please include it with your message.